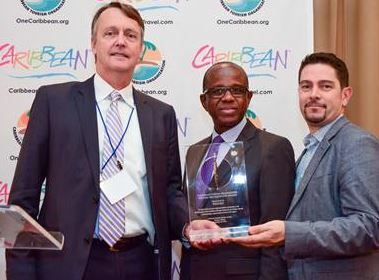 (9 Feb, 2017) – The Caribbean Tourism Organization (CTO), the Caribbean’s tourism development agency, has entered into a marketing partnership with leading air travel data provider OAG to provide members with accurate, timely and actionable insight and analysis to aid decision-making and to spot opportunities in essential markets. The two organizations signed a cooperation agreement this morning at the CTO’s headquarters in Barbados, which provides for frequency and capacity data for the region, along with commentary on significant changes, to be accessible to CTO members. OAG will also provide CTO members with market reviews highlighting key variances as well as analysis identifying unserved markets and examining air traffic volumes throughout the major gateways serving the region. Members will also be able to access on-time performance data for major airlines and airports. OAG has the world’s largest network of air travel data including the definitive schedules database of more than 900 airlines and over 4,000 airports. With the most extensive flight status information database in the market, OAG handles approximately 54 million records of flight status updates per year, processes 1.4 billion requests and continues to deliver in excess of 35 million dynamic flight status updates daily. With this new strategic partnership with the CTO, OAG becomes the exclusive provider of schedules, traffic and flight status data. BRIDGETOWN, Barbados (7 Feb. 2017) – The Caribbean Tourism Organization (CTO), the region’s tourism development agency, and Airbnb, whose community marketplace provides access to millions of unique accommodations, today signed a landmark agreement to develop a set of policy principles and recommendations on the sharing economy for Caribbean governments and other stakeholders. Under the agreement, signed at the CTO’s headquarters secretary general and chief executive officer Hugh Riley and Airbnb’s Shawn Sullivan, public policy director for Central America the Caribbean, both organizations will share data and studies with policymakers about the positive impact of the sharing economy in the region; identify ways to make it more inclusive; and broaden the benefits of tourism to non-traditional actors, attract new stakeholders and focus on providing amazing and unique travel and cultural experiences to visitors. This partnership agreement will also provide to the CTO an economic analysis of Airbnb’s positive impact on local economies. By reviewing Airbnb’s aggregate data, key stakeholders will be briefed on the value of a peer-to-peer review mechanisms, at the same time Caribbean government officials and other stakeholders learn about the long term benefits of the sharing economy and home sharing in particular. “The CTO is establishing a basis for mutual cooperation with Airbnb. It is important for us to examine all aspects of this important segment of the sharing economy. We believe that by clearly understanding Airbnb’s massive influence in capturing consumers’ interest in unique accommodations we will be in a position to properly advise our members and to allow the Caribbean to achieve the goals of year-round profitability, visitor satisfaction and sustainable tourism development,” Mr. Riley said. Currently, there are 41 thousand listings across the Caribbean and a typical host in the Caribbean earns approximately US$3,900 per year. 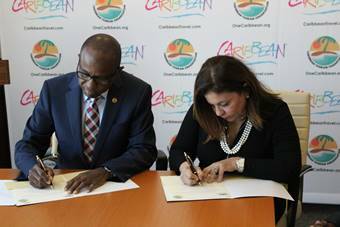 Today’s agreement will also help to identify new ways to market the Caribbean as a region: One Sea, One Voice, One Caribbean and grow the tourism industry. “This is an exciting partnership for Airbnb. We look forward to working with the CTO to develop policy recommendations for regional governments and other stakeholders on the sharing economy. 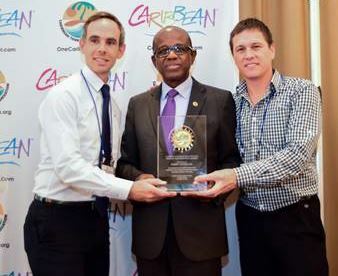 The Caribbean is an important and growing market for Airbnb and we expect continued growth there,” Mr. Sullivan said. BRIDGETOWN, Barbados (Jan. 10, 2017) – On the heels of last year’s successful Year of Romance, the Caribbean Tourism Organization (CTO) has declared 2017 the Year of Adventure in the Caribbean. This year the region will celebrate everything from adrenaline-pumping active pursuits to local culture and casually sampling experiences unique to a specific CTO destination. “Adventure comes in different degrees for travelers. For some, it is zip lining high above a valley or speeding around a motor racing circuit. For others, an adventure is simply exploring local communities to learn their language and customs, and teasing the senses with new cultural and culinary experiences,” said Hugh Riley, Secretary General and Chief Executive Officer of CTO. The 2017 Caribbean Year of Adventure will be promoted through social media and traditional media channels and will create opportunities for travelers and vacation planners to share their experiences and ideas of an adventure-filled Caribbean vacation throughout 2017. CTO has adopted the hashtag #CaribbeanAdventure and encourages all member countries and hotels to use the hashtag when posting images via social media networks. While each destination is unique and inviting in its own right, the common denominator of all Caribbean destination vacations is travelers yearning to enjoy a Caribbean Adventure – no matter how laid-back or thrilling the activity may be. Through the campaign, CTO and its member countries and hotels will highlight the Caribbean as the leading choice for a vacation filled with adventure for consumers and travel planners selling the region. The theme is designed as a catalyst for sellers and promoters of group travel, family adventure and friend-cations, as well as weddings and honeymoons. Visitors too, will be invited to submit thoughts on their most memorable Caribbean adventures. “With a variety of destinations to discover, the Caribbean provides the ultimate vacation playground highlighted by picture-perfect landscapes and ideal weather for an abundance of land and water activities,” said Riley. “The Year of Adventure will highlight the range of activities offered throughout the Caribbean. It’s a theme which can easily be embraced by all CTO member destinations 365 days a year,” Riley noted. Tours can often conveniently be arranged at a resort’s on-property tour desk. Licensed and insured on-island tour companies bring travelers beyond their resort and into the heart of the destination where guests can immerse themselves in parasailing, snorkeling and kayaking; zip line adventures; fishing charters; dolphin and whale watching; horseback riding along the beach; helicopter tours; swimming with dolphins; volcano discoveries; sailing expeditions; rain forest hikes; island exploring; tasting rich flavors and rum factory tours; celebrating Caribbean festivals, perhaps in full costume; and much more.